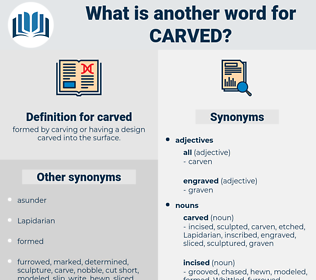 What is another word for carved? formed by carving or having a design carved into the surface. Created, divided, laid, shared, trimmed, buried, burned, handed, Did. 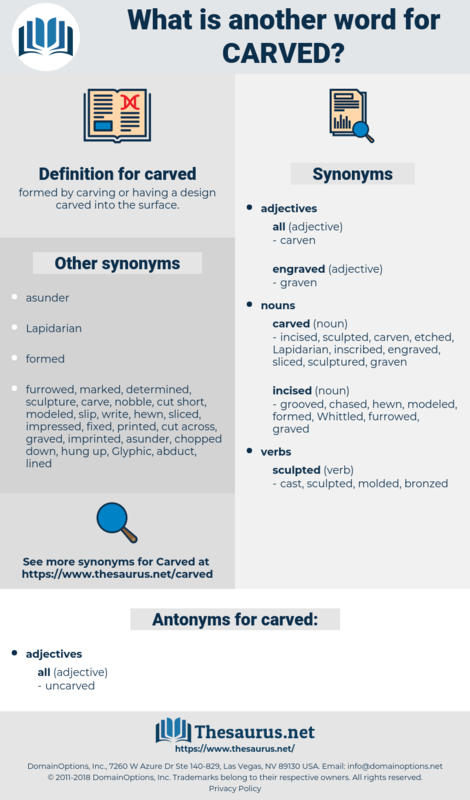 categorized, Created, Excavated, Achieved, aggravated, prepared, Riven, Constructed, inscribed, established, torn, Undertaken, Denominated, identified, Influenced, written, divided, transposed, etched, cast, incised, scratched, earned, accomplished, enforced, realised, developed, shaped, crafted, products, partitioned, framed, commissioned, mediated, eroded, realized, effected, embedded, Performed, digging, conducted, forged, completed, split, Widened, Moulded, attained, authored, set, fashioned, parted, drilled, forgotten, built, remembered, hollowed, stamped, embossed, chopped, Mapped, trimmed, Gained, formed, marked, Fielded, grouped, sunk, burned, pruned, grown, figured, chipped, milled, cut, done. There was a solid well - to - do look in everything in my uncle's house: the furniture consisted principally of carved black oak; curiosities of various kinds were hung up in the hall and on the walls of the staircase. In the 27th and 28th year of his reign he composed another series of Edicts and this time had them carved in pillars not on rocks.